Family Volley: How Have You Gone Green? Our son is very diligent. For the last two years he has talked about recycling. It started with statements about how they recycle at school. Then it turned into direct questions. "Mom, why don't we recycle?" "Mom, if we don't recycle, who will?" "Mom, we need to recycle"
My excuses aren't cutting it anymore. My ignorance is no longer acceptable. So... we have planned to sit down next Monday and make a "Green Plan." I am nervous and worried. I am a very busy mother of three young children. 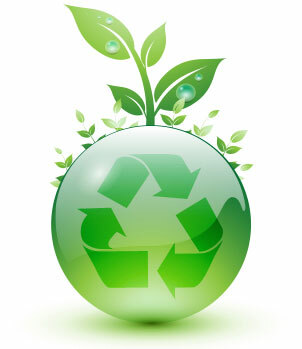 Like most people who don't know a lot about going green, it seems to be expensive and time consuming. Two things I don't have. Extra money and extra time. I am ready to support the green movement but don't know where to start, besides recycling. I want to do a better job of working it into my everyday. My first step...call in the morning and find out how we start recycling. I just hope is doesn't cost money. My second step.... no more plastic water bottles. My third step....I don't have one. In my old apartment they had huge recycling bins so it was easy- I would just separate those things that were recycleable from those that weren't and dump it in there. Now, in my new aptartment, they don't have the bins and I miss recycling. -I reuse plastic bags or take washable containers for my lunch. -I use a Camelbak water bottle (so no plastic water bottles). -Turn off lights when I'm not in/leave a room. -Unplug electronics at night. I'm told they still use power even when turned off. This helps with the electricity bill too. -Switched to the CFL (swirly) lightbulbs. They are more expensive to begin with, but you end up saving in the long run with the energy bill. I used to sort out the recycling and take it to the large bins located around our town, but then our community started a home pick up program, yeah! It costs us 5 dollars a month, they pick it up twice a month. I love it. We have reusable water bottles. I turn things off at night and when not using them. I have bought many CFL bulbs, but I don't really like them, and they don't seem to last as long as they say they do (not by a long shot actually) And I don't like having to worry about disposing of them carefully (hazardous waste) So I'm back to the regular bulbs. Just know that is is doable. Even when you are busy mom (I've got a few running around my place) They are great at helping your family meet recycling goals. Orem City charges $3/month and they pick it up every other week, not bad because it really does free up the room in your regular can..
Are you doing this because you want to, or because your son is pestering you because of what they tell him at school? I'm not opposed to recycling or anything else people want to do, but it should be a decision you make because it's right for you and your family, not because of the agenda of public schools. If you're not really into it, you'll end up resenting it, and probably giving up eventually. For example, society will frown at me for not using CFL light bulbs, but I don't like the quality of light, the blinking gives me headaches, and I don't like the idea of a light bulb that contains toxic chemicals. (Have you ever read the instructions on what to do if one breaks?!) I'm not going to be bullied into doing something that isn't right for me just because it's "green." You will find it easier than you think! Every step you take is progress, which matters much more than perfection! It is so comforting to hear about your experiences. It is do-able. That is what I needed to hear. Cathie, you make a good point. It is true that there is a lot of pressure from school, but I now want to jump on board for our family. For the good of the environment. I recognize that there has to be ways to fit it into our life, without replacing all our appliances and building a home run by solar power. I don't want to resent it. I want to make it apart of what we do, naturally. You may already doing some "green" things and not even realizing it! Ever since my mission in Germany, where they are HUGE on recycling, I've been a recycler. We pay a few $/month for the recycle can, but it frees up so much room in my regular garbage can. Also, my boys collect soda cans from neighbors, and I collect them at work, then about once/month I take them to a recycling place and get $$ for them. We donate the $$ to Primary Pennies, so we feel like our recycling efforts are making a big difference. We work on reducing water usage, and turning out lights. I also use "green" products for cleaning. I know there is a lot more we could do, but these things don't take any more time out of our life, which is really busy! Love that you started this post! I enjoyed reading what everyone is doing to be greener. This is something I've been thinking a lot about lately. You've really inspired me! P.S. I added your cute button to my blog at www.nounsandviolets.com!